Our optometrists have a special interest in contact lenses investing a significant amount of their time in continuing professional development in the field of contact lenses. We often see patients who have challenging and complex prescriptions or medical eye conditions requiring unique custom made contact lenses allowing them to enjoy clear comfortable vision. We particularly have an interest in fitting those with Keratoconus and others with irregular corneas, including those with post laser vision correction ectasia. In fact we are listed with the UK Keratoconus Self Help and Support Association as a Keratoconus friendly practice. 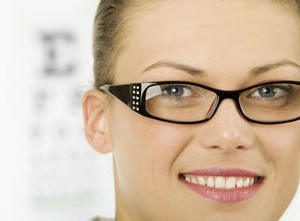 We are able to get lenses from a multitude of providers and thus meet peoples individual needs. KeraSoft® IC is a specially designed soft lens that fits all irregular corneas, including post laser refractive surgery, Pellucid Marginal Degeneration (PMD) and other complex corneal irregularities. It is the world’s first soft lens to incorporate Sector Management Control (SMC) which allows manipulation of specific area of the lens periphery – something only previously possible for rigid lenses. KeraSoft® IC has a number of configurable lens parameters, including customisable periphery design and Sector Management Control (SMC) which, uniquely, can be fully tailored to meet the needs of the individual eye. Incorporating wavefront optics KeraSoft® IC is available in a choice of two materials; a 3 month 74% water SiH material, and a 12 month conventional high water 77% material. With the recent increase in post-laser refractive surgery corneal changes, this lens ticks all the boxes for health, optics, comfort and ease of fitting. Remember when you had only two choices in contact lenses? 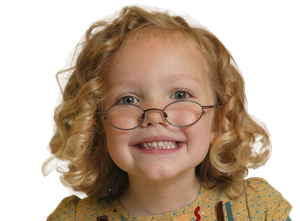 “Hard” (RGP) lenses provided good vision, but were often irritating and uncomfortable. 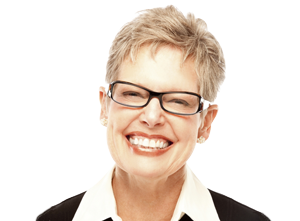 Soft lenses offered good comfort, but couldn’t correct your vision problems. Now, a technological breakthrough makes having to compromise a thing of the past. ClearKone® hybrid contact lenses offer all the benefits of rigid gas permeable (RGP) and soft contact lenses without any of the disadvantages for an overall GREAT contact lens experience. ClearKone® is an FDA-cleared hybrid contact lens specifically designed for the treatment of keratoconus and other corneal irregularities. Using a revolutionary technology, ClearKone® combines the best of both worlds – the crisp vision of a high-oxygen rigid RGP contact lens with the all-day comfort and convenience of a soft lens. ClearKone® is specifically designed to restore vision to patients with the many types and stages of keratoconus. Because the ClearKone® lens vaults over the cornea, there’s minimal risk of corneal scarring, making ClearKone® hybrid contact lenses a healthy treatment option for keratoconus. In addition, the soft skirt of the ClearKone® design helps to center the contact lens over the visual axis regardless of where the cone is located on the cornea or how large it is, thereby decreasing visual distortions and providing superior vision. The ClearKone® design also prevents dirt from getting under the lens and will not pop out unexpectedly. No other contact lens available today can provide all of these benefits in a single product. The surface of an irregular cornea is just that – irregular. The “peaks and valleys” of an irregular cornea pose a special challenge when it comes to vision correction options. Contact lenses with a rigid surface are the undisputed gold standard for restoring vision to irregular cornea patients. A rigid surface over an irregular cornea mimics a spherical (normal) eye, allowing the light to focus properly on the eye to provide clear vision. The ClearKone® lens has a rigid center that creates a smooth uniform surface. The way the lens vaults over the cornea allows a layer of tears to form between the back surface of the rigid center and the eye. The tear layer fills in the “peaks and valleys” allowing light to focus properly to provide crisp, clear vision. The ClearKone® fitting approach called “vaulting” allows practioners to simply increase the depth of the contact lens over the cornea depending on how steep or severe the individual patient’s keartoconus is. The ClearKone® vault system comes in 11 different choices and therefore can accommodate even the most severe forms of keratoconus. Your practioner will choose a vault that just clears your cone so the RGP portion of ClearKone® does not bear on the surface of your cone, virtually eliminating the chances of corneal scarring. An important element of the ClearKone® design is the soft skirt. Not only does the soft skirt provide exceptional all-day comfort and prevents dirt from getting under the lens, it also contributes to the excellent vision achievable in ClearKone®. RGP lenses alone can move around on the eye, often “centering” on the steepest part of the cornea where the cone is located which is generally not in alignment with the visual axis of the patient. This decentering of the RGP contact lens off of the visual axis results in distorted vision, halos and glare and less than optimal visual acuity for the patient. 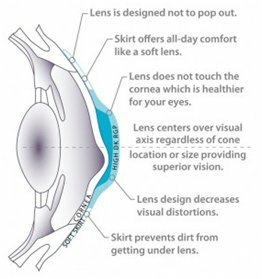 Because the ClearKone® lens has a soft skirt, the optical center of the contact lens is held in place centered on the eye and most importantly in line with the visual axis of the patient. This is why patients often report much better visual acuity in the ClearKone® lens and a marked improvement in the quality of the vision they can achieve in ClearKone®. The unique design of the ClearKone® lens combines the best features of other contact lens designs into a single lens, while eliminating many of the issues that each individual lens can pose. ClearKone® is an award-winning treatment for keratoconus and is optimized to effectively restore vision to a large majority of patients with keratoconus, without compromising comfort or eye health – even in the most challenging cases. 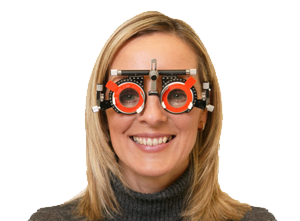 • Practitioners report that 94% of patients rate the vision they get with ClearKone® the same as or better than RGPs.